The Prayer Book of 1789 was the first for the U. S. Episcopal Church and served the Church for over 100 years, until the revision of 1892. This book owed much to its predecessor, the English 1662 Book of Common Prayer, and, at least for the major services, is very similar to it. We are presenting this electronic version of the U. S. 1789 Book of Common Prayer in hopes that it will prove useful and instructive to the Church. Parishes might find it useful in recreating historical services, for example, to celebrate the anniversary of the parish. Others might find it instructive to compare the changes, additions, and deletions, which have taken place in the various versions of the Book of Common Prayer. The 1789 Book of Common Prayer was in use in the United States from 1790 until 1892. During that time, unlike succeeding versions, it was subject to minor changes by each General Convention. These changes were then reflected in the next "Standard Edition" of the Book of Common Prayer. Such Standard Editions were produced in 1793, 1822, 1832, 1838, 1845, and 1871; changes which each introduced (more significant than corrections of typographical errors, etc.) are noted in the text. Eight original sources were used, bearing certification dates of 1876, 1873, 1854, 1849, 1841, 1821, 1818, and 1810 respectively. The texts, Prayer Book Parallels, by Paul V. Marshall, and Liturgiae Americanae (1907), by William McGarvey, were also consulted. The process leading up to the 1892 book occupied several General Conventions, from 1883 through 1892; Prayer Books published during this time therefore might (and sometimes do) include certain aspects of the 1892 book. Please note that, unlike later U. S. Prayer Books, there was no uniform appearance among the different printings of the 1789 edition from various publishers. Thus, different printings will differ in appearance through the use of different fonts, number of columns per page, pagination, etc. Rubrics were printed in smaller Roman type, rather than italics, from 1818-1845. In general, editions prior to the Civil War tended to use two columns per page; those after, one. All but one of the editions used here are also bound with the Psalms in Metre, and a words-only Hymnal. These were often certified by diocesan bishops, in much the same manner as the Prayer Book itself. The font used is Century Schoolbook, which is widely available and seems to be a fairly close match to the original. The HTML allows the similar fonts Century and Georgia as alternatives. The entire 1789 Book of Common Prayer is presented below in HTML and PDF formats. (HTML only for the Psalter, Selections of Psalms, and the 39 Articles of Religion). The PDF version is based on a fairly common 24mo edition published by the New York Bible & Common Prayer Book Society from 1857 through 1880; the specific printing used here appears in David Griffiths' Bibligraphy of the Book of Common Prayer as 1865/19. H & S Raynor, New York, 1842 (Griffiths 1842/27) (also from the Internet Archive). Prot. Episcopal Book Soc., Phildelphia, 1863 (Griffiths 1863/31). Note that these may have lines cut off, pages out of order and possibly missing, etc. Prot. 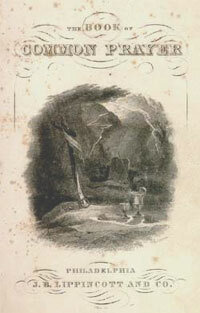 Episcopal Press, NY, 1836 (Griffiths 1836/28). We additionally have a PDF version of the 1871 Standard Book (the last "official" version of this 1789 Prayer Book), the previous 1845 Standard, a 1795 Altar Book (large folio size) and the 1790 "first edition" of the 1789 BCP. For those interested in the history of this book, we also have online the historical portions of Liturgiae Americanae, which describe how this book came to be, and how it developed over the years. Further history and a description of early printings of this book may be found in Early Prayer Books in America, from Google Books. We also have online the 1789 Book of Common Prayer in French (Livre des Prières Publiques). 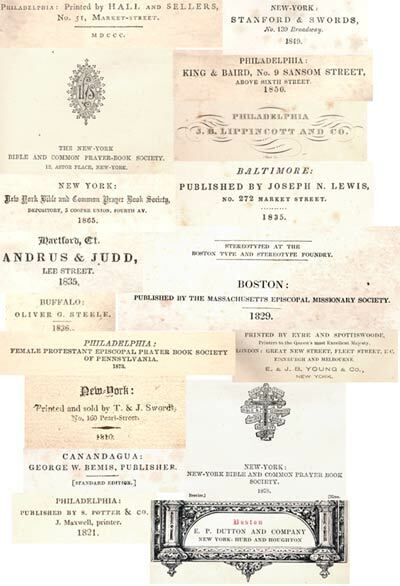 Google Books also has online a compilation, Prayers adapted to Various Occasions of Social Worship, for which Provision is not made in the Book of Common Prayer, by Alexander Griswold (first bishop of Massachusetts), 1860. PDF: First Sunday in Advent through Ascension Day; from Sunday after Ascension, including Saints' Days. Note: It appears that the Ordinal and the Form of Consecration of a Church were generally omitted in Prayer Books printed before about 1810.